Jama Masjid is located in Old Delhi area of Chandni Chowk opposite to Red Fort. It is also known as Friday Mosque. It is India’s largest mosque can hold more than 25,000 people. It was built in 1656 and construction was started in 1644. 5,000 workers were involved in the construction of the beautiful Mosque. 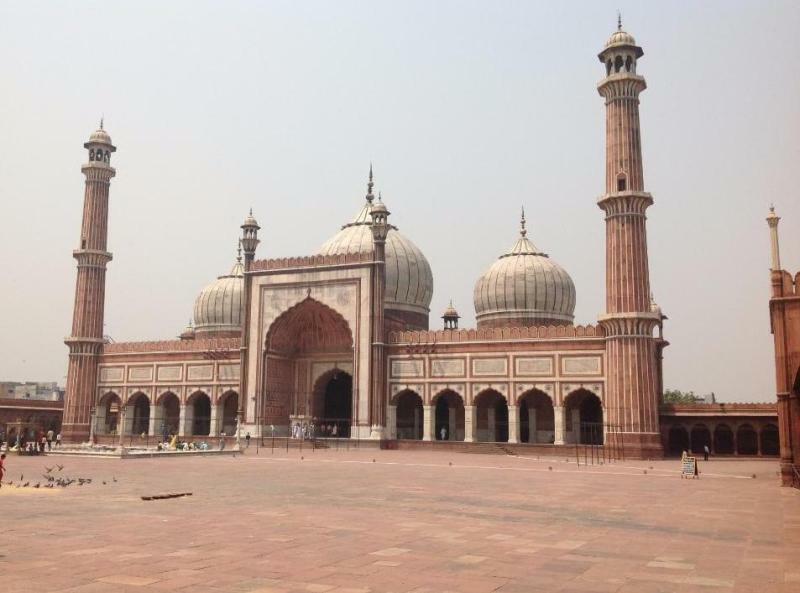 Jama Masjid was built by Mughal Emperor Shah Jahan and it costs him 1 Million Indian Rupees (10 Lac Rs). Taj Mahal and Red Fort also built by Shah Jahan. The inauguration of the Mosque was done by an Imam of Bukhara (Uzbekistan) on 23 July 1656. Red Sandstone and White marble used in the construction of the Mosque. The mosque has three great gates, four towers and two high Minarets along with large premise for offering prayers. Both minarets are 40 Meter high, and offer a splendid view of Old Delhi from the Minarets. Minarets consists 130 steps. Jama Masjid built on the red sandstone porch which has 30 feet high from ground level. Mosque length is 80 meters and width is 27 meters. A Madarsa was also present in the complex, which was destroyed during the revolt of 1857. Timing of Jama Masjid is from 7 AM to 12 PM and 1.30 PM to 6.30 PM and it opens on all days of week for visitors. Visitors are not permitted during prayer time. Entry is completely free and visitors need to pay 200 Rs for Photography charges. You need to pay 200 Rs fee for Digital camera and Mobile camera, whether you are clicking the pictures or not. So it is advisable for visitors do not bring cameras here if you are not in the mood of capturing the photos of Masjid. Re-entry on the same day is allowed in the mosque if you buy Camera tickets. Visitors can also enter in the minarets by paying the entry fee and take a look of Delhi from 40 Meter high minaret. Jama Masjid is located in crowded Chandni Chowk in Old Delhi. The nearest metro station is Chawri Bazaar. Chawri Bazar is around 700 meters away from the mosque. The Chandni Chowk Metro station is also a Good option to reach here. Visitors can reach here via auto rickshaw, cab or city bus service. It is located in very crowded area; therefore Delhi Metro is the best option is to reach here. Old Delhi Railway Station and New Delhi Railway Station is 3 KM and 4 KM away here respectively. Indira Gandhi International Airport is 25 KM away from the Masjid. It is located in very crowded areas, so it is recommended to visit the place in the morning time before the opening of markets (Before 10 AM). Beware of touts during the visit of the mosque. Shoes are not allowed inside the mosque, so it advised for visitors carry a bag so that they can pack their shoes in the bag and carry the bag along with them in the mosque. Shoes counter is also present in the mosque. After paying a visit in Jama Masjid, visitors should miss a visit of Red Fort and shopping in Chandni Chowk. Visit Humayun Tomb and Safdarjung Tomb in Delhi for exploring more Mughal architecture. Check places to visit in Delhi for list of all the tourist places in Delhi.